The big news this week is that I have recently taken over Jessica Hayes chimney sweeping business ‘The Saffron Walden Village Chimney Sweep’, as she has retired from sweeping. Many people will know Jessica as she has been the only female chimney sweep in the area for a number of years now! And all credit to her I say in what is largely seen as a male dominated industry! I think Jessica has done ever so well over the years, as chimney sweeping is not the easiest of jobs, it is physically demanding and can be quite tiring. Taken with the fact that Jessica is only very slightly built, she has done remarkably well to contend with her male colleagues. Women like Jessica are a positive role models for others and a reaffirmation of gender equality in the work place! Over the years Jessica has built up a large and loyal customer base, so I would now like to extend a warm welcome to all of Jessica’s customers and say that I’m looking forward to meeting you all in the future! I am aware that Jessica ran a forward appointments diary for her regular customers. I will now be undertaking all Jessica’s forward appointments and will Endeavour to contact everyone prior to their respective appointments by way of a reminder. 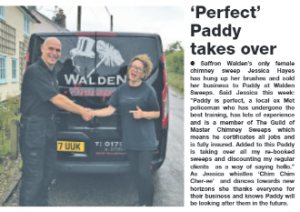 So here’s to a new future of clean, efficient, professional chimney sweeping with Walden Sweeps!